I've only ever used pecans, but I suppose any nut would do. We always seem to have an over-abundance of pecans and this is a perfect recipe to make a very tasty treat with them. Simmer sugar and water in a Teflon-coated large fryer for 5 minutes, stirring occasionally. Add vanilla and cinnamon and mix well. Add pecans and stir constantly over medium heat. Continue cooking until the mixture reaches dryness. Pour over wax paper on a cookie rack. These things are highly addictive and make a good gift. J - do you use a candy thermometer or let the mix go above 220 degrees before throwing in the nuts? If you add cayenne, you get sweet, salty and spicy! I will take nuts anyway I can get them. I'm betting that didn't come out right. Last edited by kelmac07; 12-12-2012 at 08:21 PM. Lol I was curious who would be first to bite. No candy thermometer. Have made these numerous times. The key is you continue a medium heat until the mixture goes dry. Constantly stirring. It'll be all bubbly and within a minute or two it goes to complete dryness. There's nothing in the pan but sugar-coated pecans and the leftover sugar. 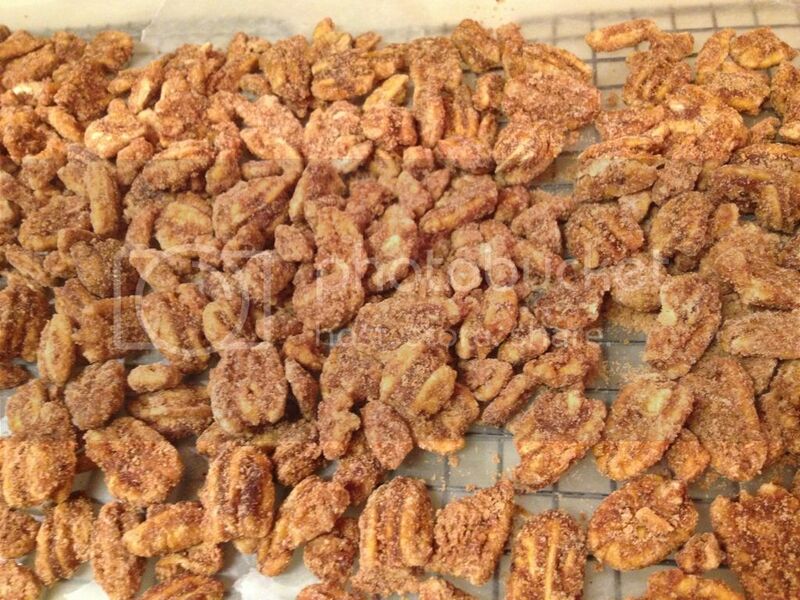 At that time dump the pecans on the cooling sheet. I shall try this. Good recipe, bro.